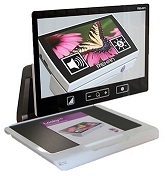 The Acuity 22" with speech by Rehan is the the best desktop magnifier available. Including the ability to read text to you, and sporting a Full HD camera and large 22 inch monitor, the Acuity with Speech produces an image that is unsurpassed. Incorporating an easy-to-use touchpad for intuitive controls, reflection and shadow free lighting, the Acuity is your first option for high quality magnification. © 2017 the BraillerDepot, LLC | Nearly 20 years of Experience Integrating Systems for the Visually Impaired.